We’ve overhauled every aspect of Carbonmade and we think you’re going to love it. Scroll down to see all the super magical new features. Themes so nice you’ll think they’re Canadian. We’ve added five gorgeous themes each of which is designed with love by artisan puppies. And this is just the beginning! We’ll release new themes just as quickly as their little puppy paws can churn them out. See the changes you’re making to your portfolio AS YOU MAKE THEM. Marvel at how much easier it is to create, order, archive and edit your projects. 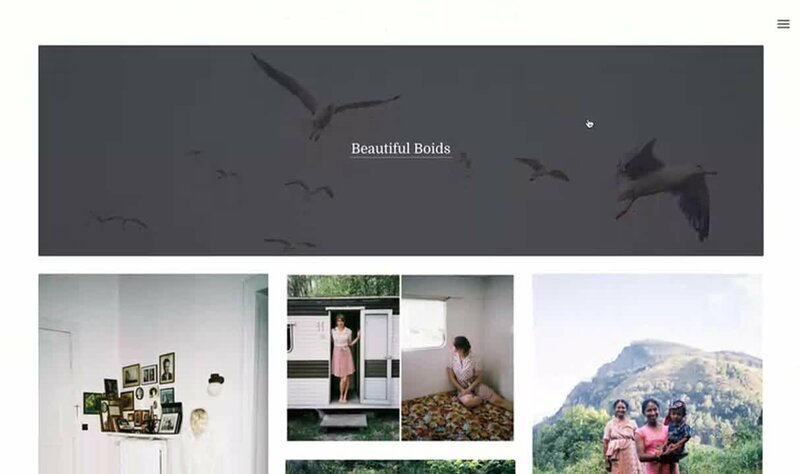 Upload your pieces lickety-split with our new uploader and fancy caption editing. Designing your portfolio shouldn’t be rocket surgery. We’ve rolled out a full blown rehash of the personalization options. Preview all your changes in real-time and try on Themes like it’s a fancy dress party. You get just the right amount of control over your design. Spend your time making work rather than fussing about with your portfolio! Recruiters and creative hirers asked us to beef up the Talent Pool and we’ve done just that. We’ve drastically improved the search to help you get found and revamped the entire look. Better tools to tell your story. Show off your stellar life skillz with our Education, Experience, Awards and Exhibitions blurbs. List out your clients, attach your resume and link up your social media empire. Our shiny new Contact page lets you control how folks can get in touch. Flag if and when you’re available, share your contact details and/or hook up a spam-thwarting Contact Form. A simple stats experience minus the nonsense pie charts. Who doesn’t love making a pretty purple mountain range out of statistical information? Track views, visitors, your bestest projects and more. Send folks wherever you want ‘em. Link up your store, your blog, or your He-Man fanfiction. We’ve expanded the ways you can label your work. Date, Role, URL, Type and more. You can even make your own from scratch. Packrats rejoice! Store your work forever. Hide old work with ease. Never delete anything. You'll sleep like a wee baby. Keep up on all things Carbonmade. Get word of new features, theme releases and special announcements right on your dash. All of our Themes are rarin’ to go on your mobile devices. Phones! Tablets! Carrier pigeons! You name it! Never worry about your portfolio being ready for the world. Our uptime is the best it’s ever been and the app is super snappy. Upload your demos, radio ads, screeching car chase sound effects or just the pleasing sound of your own voice. Hear, hear! Easily add original tearsheets, magazine spreads or any other PDFs you've got. We'll convert and display them most prettily. Don’t hulk out doing things one by one. Keep calm and Move or Delete your pieces in bulk. A plan for every occasion. You asked for a better way to pay for Carbonmade and we’ve delivered. Introducing two new plans: Okay and LASER WHALE. Okay is perfect if you’re on a budget and LASER WHALE is for those who need no holds barred. Whew! That’s a lot. We are super hyped to see what you cook up. So, let’s getcha started! Sign up for the new Carbonmade!